Quickly go to any open case based on the "Other Party" field. The Other Party field has now been placed below the subject field above the notepage. Now print the "Open Case List" from this form. Improved Handling of Retainer data. A new View button has replaced the View All/UnPaid button. A popup menu will now appear with many options for viewing invoices. Payment Dates can now be edited: There is now the option of changing the Payment Dates for invoice payments. In order to make the program operation seamless, this has introduced complications in certain program implementations. Complications arose in Payment dates due to the Retainer feature. Part of the seamless operation of the program is the way it handles Retainer information. Retainer information is entered on the Cases form. Once an invoice is generated, the Retainer information is moved to the Invoice Payments table. The Retainer is always the first record in the invoice payment table. If for some reason you need to change information in the payment table then any changes made to the retainer record is propagated back to the Cases form. Because of the special nature of the retainer payment, no payment can have a payment date change earlier than the Retainer. Likewise, any date change to the Retainer payment can not have a date change "later" than other payments for the current invoice. All necessary checks are made automatically by PI Helper. Deleting Invoice Payment records: In the past, press "Ctrl-Delete" had to be pressed to delete a payment record. Now, right-clicking a payment record will display a popup menu with "Delete Payment" as an option. 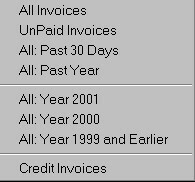 Past Due notepage: There is a new option to display "All UnPaid" invoices. Timelog Form: Quickly go to any open case based on the "Other Party" field. The Other Party field has now been placed below the subject field above the notepage.